The historian Tom Nairn famously said that Scotland will be free “when the last minister is strangled by the last copy of the Sunday Post“. The significance of religious identity has played little part in the referendum debate or even in its academic analysis, but I was reminded of Nairn’s quote earlier this week when looking at the cross-followings on Twitter between the two campaign twitter accounts and the accounts of other personalities and organisations. There is a startling correlation between someone following accounts linked to Celtic and following the Yes Scotland campaign, and between following accounts linked to Rangers and following the Better Together campaign. The followers of Twitter accounts towards the right are more likely to also follow Yes Scotland and those towards the left more likely to follow Better Together. Earlier in the week I also attended a morning of presentations on the 2014 Scottish Social Attitude survey, where a lot of the analysis involved teasing out trends in the data so subtle it was unclear whether they were statistically significant. One explanation for the discrimination between Celtic and Rangers twitter followers orientations to the referendum is that it is a proxy for a difference due to religious identity. If so, it should be possible to identify this effect in the Scottish Social Attitude survey data. The 2014 data will not be released to general researchers until next summer, but the data for a detailed survey of attitudes to constitutional change in the 2013 survey has recently been released. The data from the 2013 and 2012 surveys for the referendum question, plus older data for many questions, are accessible to anyone on the What Scotland Thinks website. The site allows variables to be cross-tabulated, so anyone can access the site and cross-tabulate voting preference with “religion”. The bar chart is difficult to interpret; its most obvious insight is that people who do not know what religion they are also tend not to know how they will vote, which at least shows a consistent lack of self-awareness. Interpreting the bar chart is an excellent example to refute the assumption that graphical representations of data always provide more insight than tables. 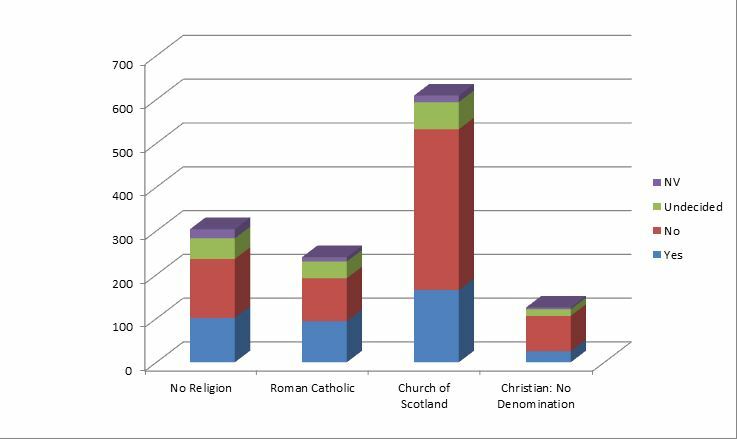 The data in the table shows clear differences between religious classes, especially between respondents who identify as Church of Scotland and Roman Catholics, with Church of Scotland followers 17% for Yes and 59% for No and Roman Catholics 26% for Yes and 37% for No. So this data is showing that Catholics are 1.5 times more likely to intend to vote Yes than Church of Scotland followers, and Church of Scotland followers 1.6 times as likely to intend to vote No. To understand the significance of these differences, in both senses of the word, it is necessary to know how many respondents are classified as following each religious group; if only 1% of Scotland’s population are reporting themselves as Catholic and Church of Scotland, then this table means little. To look at this in more detail requires looking at the actual data. Thankfully the data for the Scottish Social Attitudes Survey from 2013 and earlier can be downloaded from the UK Data Service. The 2013 survey included the “Should Scotland..” referendum question, but followed up with a question for Don’t Knows to squeeze out which way they were more likely to vote. The demographic data not only asked for current religious identity but also the religion of their family upbringing. This chart shows the split of support for Yes, No and Undecided across four classes of upbringing (No Religion, Roman Catholic, Church of Scotland and Christian: No Denomination) after the Undecideds have been squeezed. The proportions for each category from the total population [n=1497] are: No Religion, 20.3%; Roman Catholic 16%; Church of Scotland, 40.7%; Christian:No Denomination, 8.4%. The data implies that someone brought up in a Catholic environment is 1.4 times more likely to tend to support Yes than someone brought up in a Church of Scotland environment (39.2% to 27.1%), and someone brought up in a Church of Scotland environment is 1.5 times more likely to tend to support No than someone brought up in a Roman Catholic environment (60.3% to 40.8%). This chart shows the split of support for Yes, No and Undecided across the three classes of current religious affiliation after the Undecideds have been squeezed. 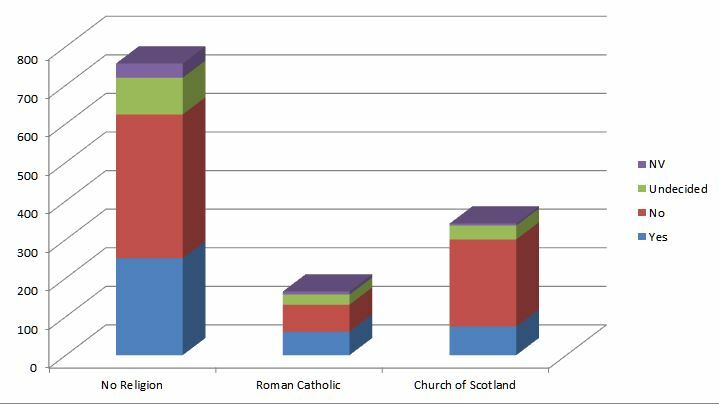 The proportions for each category from the total population [n=1497] are: No Religion, 50.5%; Roman Catholic 11.0%; Church of Scotland, 22.8%. Someone identifying as Roman Catholic is 1.7 times more likely to tend to support Yes than someone identifying as Church of Scotland (37.0% to 21.7%), and someone identifying as Church of Scotland is 1.56 times more likely to tend to support No than someone identifying as Roman Catholic (66.3% to 42.4%). In this crude analysis of the Social Attitudes Survey data, the effect of religious identity seems large relative to the more widely reported age and gender effects.Professor Rosie of Edinburgh University posted an article last year arguing, based on a discussion of the 2012 Social Attitudes Survey, that the “modest differences we can find between Catholics and Church of Scotland identifiers in their attitudes towards independence are not due to Protestantism or Catholicism, nor to history, heritage, or religious politics.” Rosie has developed this argument in a paper recently published in the Scottish Affairs academic journal. He argued against a claim that Roman Catholic identifiers are more opposed to constitutional reform by noting they are found to be more in favour, which contradicted his conclusion that there is no effect either way. The article includes little data from the 2012 survey to back up this claim., but it can be investigated in the newer 2013 data. If we look at the evidence from the SSA Survey for the breakdown of respondents who said they were brought up in a Church of Scotland environment we can see evidence to support Rosie’s claim. The 609 respondents are predominantly at the older end of the age distribution, with 41.5% over 65 years old. They also appear to tend more towards No and less towards Yes as they get older, so a general effect that all respondents (including those brought up in Roman Catholic or non-religious environments) become more unionist as they get older and it is the large proportion of the older Church of Scotland respondents that explains the high overall level of unionist support at 50.7% is plausible. However, if we look at the evidence from the SSA Survey for the breakdown of respondents who said they were brought up in a non-religious environment we can see evidence that it is not solely this age effect explaining the high level of Church of Scotland identifiers’ support for the union. If Rosie’s claim is true, we would expect to see the cell percentages similar between the two tables with differences in the n values explaining the differences between the final column percentages i.e. someone in the 65+ band who was raised in a Church of Scotland environment will have the same high probability of intending to vote No as someone raised in a non-religious environment, but we would expect to see more of them. In the 12 cell comparisons between two tables it is only for 25-34 year-old respondents intending to vote Yes that the Church of Scotland respondents are not more likely to intend to vote No and less likely to intend to vote Yes. This implies that there is an age effect, with older respondents being more unionist, but it also implies an effect due to religious identity, with respondents raised in a Church of Scotland environment tending to be more unionist than those raised in non-religious environments, independent of their age. The next stage in this analysis will be to use logistic regression to determine the size of the inter-religion effects. Following the descriptive analysis it appears that the Roman Catholic upbringing respondents are close in their distribution to those of No Religion, while the “Christian: No Denomination” group are close to the Church of Scotland, but with a distribution across age categories not so skewed towards the high end. Charts make it easier to see that there does appear to be a difference in support for the union between people brought up in Church of Scotland or Christian, No Denomination environments and those brought up in Roman Catholic or No Religion environments. Numbers of respondents in each age band for each classification of religion of upbringing. Percentages tending to vote No in each age band for each classification of religion of upbringing. To come back to where I started, if there is no religious identity effect, what is causing the social media relationships between Celtic and Yes, and between Rangers and No? But in a future post I will analyse the data to find out whether there is a Sunday Post readership effect.